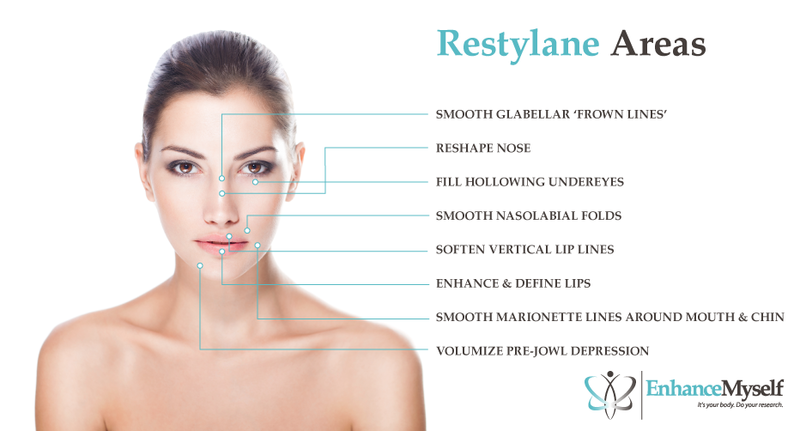 Restylane is an injectable dermal filler used to fill fine lines and facial wrinkles or improve the volume of the lips or cheeks. Once injected, Restylane makes the skin smoother and plumper, erasing the signs of aging. An injectable solution containing hyaluronic acid, which naturally occurs in the body, it can be injected in just minutes in the doctor’s office. Most candidates for Restylane are looking to hide signs of aging like facial folds and wrinkles. Other patients seek Restylane injections to increase the volume of facial features like the chin, lips, or cheeks. Restylane can also add skin moisture, resulting in skin that looks smoother and younger. Ideal candidates are adults in good health why are realistic about the potential results of injection and the temporary nature of these results. Restylane is not appropriate for people who are pregnant or breastfeeding, or who have active skin injections near the intended injection site. Some medical conditions or medications may also make otherwise suitable patients ineligible for treatment with Restylane. Restylane Touch has the smallest particle size. It is intended for injection in the outer layers of the skin, to fill in fine facial wrinkles like crow’s feet. Restylane Perlane is formulated for treating deeper creases and may also be used to increase volume in specific facial areas like the lips or cheeks. Restylane SubQ is made with the largest particle size. As a result, it is capable of filling the most volume and creating the most dramatic changes. The injection process usually takes under an hour in the doctor’s office. Most patients undergo treatment using no anesthesia, along a small dose of either topical or local anesthesia may be offered. The clear gel is injected through a thin needle into the area of skin being treated. Immediately after the Restylane has been injected, patients are free to leave the doctor’s office. Dermal filler injections like Restylane are considered to be relatively safe, non-invasive cosmetic treatments, but they are not without potential risks. The risks of Restylane injections include swelling, redness, and infection, although most patients experience no side effects or complications. Unlike some other dermal fillers, Restylane only contains components found naturally in the body, and does not carry the risk of an allergic reaction. There is no downtime after injection, and no bandages or dressings must be worn over the treatment area. After undergoing Restylane treatments, you may notice minor swelling, itching, redness, or bruising around the injection site. However, these side effects should subside within one to two days, and you can return to work and other activities immediately. Some doctors advise their patients to avoid strenuous exercise for two to three days after treatment. DID YOU HAVE RESTYLANE INJECTIONS? The full results of the injection are usually visible about three days after treatment and last up to six months. Over time, the injected Restylane will be absorbed by the body, and the results will fade. Restylane injections average approximately $350 to $500 per cubic centimeter (cc), a measure of the volume of Restylane gel injected. The volume of gel required for your treatment session depends on the desired results, as well as the deepness of the wrinkles. While some patients receive only 1cc during each treatment session, others require up to 3cc to achieve their aesthetic goal. Restylane injections tend to be among the least expensive of all cosmetic injectables. If you wish to spread out this cost, ask your doctor about financing options and payment plans.